"1. An Act for enabling His Majesty to settle a Revenue, for supporting the Dignity of her Royal Highness the Princess, in case she shall survive his Royal Highness the Prince of Wales; and for exempting such Yearly Sum or Sums of Money as His Majesty hath granted, or shall grant, to his said Royal Highness, from the Payment of Fees, Taxes, and other Charges whatsoever; and for enabling his said Royal Highness to make Leases of Lands, Parcel of the Dutchy of Cornwall, or annexed to the same." "2. An Act for repealing the present Duty on Sweets, and for granting a less Duty thereupon; and for explaining and enforcing the Execution of an Act passed in the Ninth Year of His present Majesty's Reign, intituled, "An Act for laying a Duty upon the Retailers of Spirituous Liquors, and for licensing the Retailers thereof;" and for appropriating the Supplies granted in this Session of Parliament; and for making forth Duplicates of Exehequer Bills, Lottery Tickets, and Orders, lost, burnt, or otherwise destroyed." "3. An Act for laying a Duty upon Apples imported from Foreign Parts; and for continuing an Act passed in the Fourth Year of the Reign of His present Majesty, for granting an Allowance upon the Exportation of British-made Gunpowder; and for taking off the Drawback upon Exportation of Foreign Paper; and for the better securing the Payment of the Bounty on the Exportation of British-made Sail Cloth; and for giving further Time for the Payment of Duties omitted to be paid for the Indentures and Contracts of Clerks and Apprentices." "4. An Act for repealing the Duties payable ad Valorem upon Foreign Oysters imported into this Kingdom; and for laying another Duty thereon." "5. An Act for indemnifying Persons who have omitted to qualify themselves for Offices, or to take the Oaths required, within the Time limited by Law; and for allowing further Time for those Purposes." "6. An Act for Relief of Insolvent Debtors." "7. An Act to explain and amend so much of an Act made in the Twelfth Year of the Reign of Queen Anne, intituled, "An Act for reducing the Laws relating to Rogues, Vagabonds, sturdy Beggars, and Vagrants, into One Act of Parliament; and for the more effectual punishing such Rogues, Vagabonds, sturdy Beggars, and Vagrants, and sending them whither they ought to be sent," as relates to common Players of Interludes." "8. An Act for the more effectual preventing the unlawful playing of Interludes within the Precincts of the Two Universities, in that Part of Great Britain called England, and the Places adjacent; and for explaining and amending so much of an Act passed in the last Session of Parliament, intituled, "An Act for laying a Duty upon the Retailers of Spirituous Liquors, and for licensing the Retailers thereof," as may affect the Privilege of the said Universities, with respect to licensing Taverns and all other Public Houses within the Precincts of the same." "9. An Act to disable Alexander Wilson Esquire from taking, holding, or enjoying, any Office or Place of Magistracy, in the City of Edinburgh, or elsewhere in Great Britain; and for imposing a Fine upon the Corporation of the said City." "10. An Act for the more effectual bringing to Justice any Persons concerned in the barbarous Murder of Captain John Porteous, and punishing such as shall knowingly conceal any of the said Offenders." "11. An Act for continuing an Act for the more effectual punishing wicked and evil-disposed Persons going armed and disguised, and doing Injuries and Violences to the Persons and Properties of His Majesty's Subjects, and for the more speedy bringing the Offenders to Justice; and for continuing Two Clauses, to prevent the cutting or breaking down the Bank of any River or Sea Bank, and to prevent the malicious cutting of Hop-binds, contained in an Act passed in the Sixth Year of His present Majesty's Reign; and for the more effectual Punishment of Persons removing any Materials used for securing Marsh or Sea Walls or Banks; and of Persons maliciously setting on Fire any Mine, Pit, or Delph, of Coal, or Cannel Coal; and of Persons unlawfully hunting, or taking any Red or Fallow Deer, in Forests or Chases; or beating or wounding Keepers or other Officers in Forests, Chases, or Parks; and for more effectually securing the Breed of Wild Fowl." "12. An Act for collecting, at the Port of Leghorn, certain small Sums of Money, to which the Merchants trading there have usually contributed, for the Relief of shipwrecked Mariners, Captives, and other distressed Persons, His Majesty's Subjects; and for other charitable and public Uses." "13. An Act for regulating the Company of Watermen, Wherrymen, and Lightermen, rowing on the River Thames, between Gravesend, in the County of Kent, and Windsor, in the County of Berks." "14. An Act for explaining and amending an Act passed in the Ninth Year of the Reign of His present Majesty, intituled, An Act for building a Bridge cross the River Thames, from The New Palace Yard, in the City of Westminster, to the opposite Shore, in the County of Surrey." "15. An Act to enable the Magistrates and Town Council of the Borough of Lanark to repair and maintain their Bridge over the River Clyd, at Clydsholm, in the Shire of Lanark." "16. An Act for making navigable the River Rodon, from a little below a Mill called Barking Mill, in the County of Essex, to Illford Bridge, in the said County." "17. An Act for repairing the Road from Hertford Bridge Hill, to the Town of Basingstoke; and also the Road from Hertford Bridge Hill aforesaid, to the Town of Odiham, in the County of Southampton." "18. 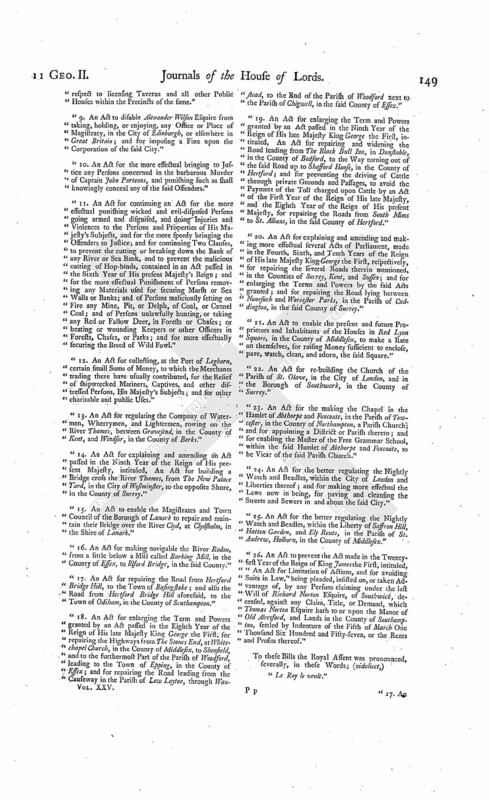 An Act for enlarging the Term and Powers granted by an Act passed in the Eighth Year of the Reign of His late Majesty King George the First, for repairing the Highways from The Stones End, at Whitechapel Church, in the County of Middlesex, to Shenfield, and to the furthermost Part of the Parish of Woodford, leading to the Town of Epping, in the County of Essex; and for repairing the Road leading from the Causeway in the Parish of Low Layton, through Wanstead, to the End of the Parish of Woodford next to the Parish of Chigwell, in the said County of Essex." "19. An Act for enlarging the Term and Powers granted by an Act passed in the Ninth Year of the Reign of His late Majesty King George the First, intituled, An Act for repairing and widening the Road leading from The Black Bull Inn, in Dunstable, in the County of Bedford, to the Way turning out of the said Road up to Shafford House, in the County of Hertford; and for preventing the driving of Cattle through private Grounds and Passages, to avoid the Payment of the Toll charged upon Cattle by an Act of the First Year of the Reign of His late Majesty, and the Eighth Year of the Reign of His present Majesty, for repairing the Roads from South Mims to St. Albans, in the said County of Hertford." "20. An Act for explaining and amending and making more effectual several Acts of Parliament, made in the Fourth, Sixth, and Tenth Years of the Reign of His late Majesty King George the First, respectively, for repairing the several Roads therein mentioned, in the Counties of Surrey, Kent, and Sussex; and for enlarging the Terms and Powers by the said Acts granted; and for repairing the Road lying between Nonesuch and Worcester Parks, in the Parish of Cuddington, in the said County of Surrey." "21. An Act to enable the present and future Proprietors and Inhabitants of the Houses in Red Lyon Square, in the County of Middlesex, to make a Rate on themselves, for raising Money sufficient to enclose, pave, watch, clean, and adorn, the said Square." "22. An Act for re-building the Church of the Parish of St. Olave, in the City of London, and in the Borough of Southwark, in the County of Surrey." "23. An Act for the making the Chapel in the Hamlet of Abthorpe and Foxcoate, in the Parish of Towcester, in the County of Northampton, a Parish Church; and for appointing a District or Parish thereto; and for enabling the Master of the Free Grammer School, within the said Hamlet of Abthorpe and Foxcoate, to be Vicar of the said Parish Church." "24. An Act for the better regulating the Nightly Watch and Beadles, within the City of London and Liberties thereof; and for making more effectual the Laws now in being, for paving and cleansing the Streets and Sewers in and about the said City." "25. 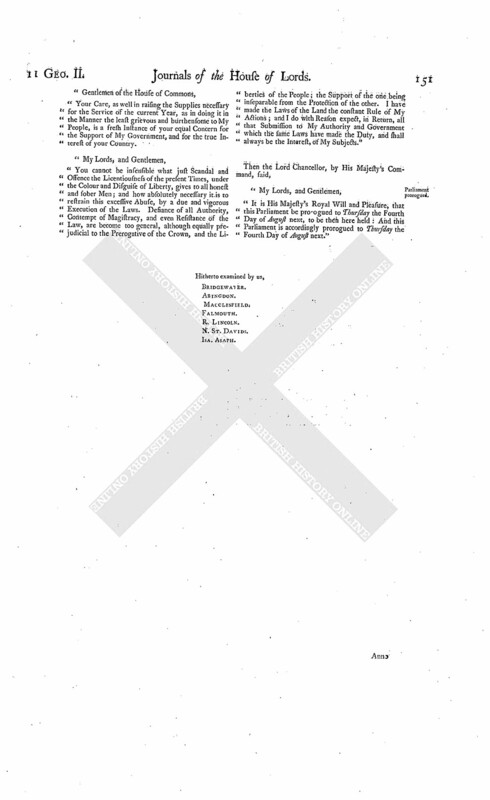 An Act for the better regulating the Nightly Watch and Beadles, within the Liberty of Saffron Hill, Hatton Garden, and Ely Rents, in the Parish of St. Andrew, Holborn, in the County of Middlesex." "26. An Act to prevent the Act made in the Twentyfirst Year of the Reign of King James the First, intituled, "An Act for Limitation of Actions, and for avoiding Suits in Law," being pleaded, insisted on, or taken Advantage of, by any Persons claiming under the last Will of Richard Norton Esquire, of Southwick, deceased, against any Claim, Title, or Demand, which Thomas Norton Esquire hath to or upon the Manor of Old Alresford, and Lands in the County of Southampton, settled by Indenture of the Fifth of March One Thousand Six Hundred and Fifty-seven, or the Rents and Profits thereof." "27. An Act for Sale of Part of the Estate of Daniel late Earl of Winchilsea and Nottingham, deceased, for Payment of Debts and Encumbrances charged upon and affecting the same; and for other Purposes therein mentioned." "28. An Act for establishing and confirming a Partition of the Estates of Sir Robert Furnese Baronet, deceased, among his Three Daughters and Coheirs; and for settling their several specific Shares and Allotments to such Uses as their several undivided Third Parts thereof stood limited before such Partition; and for other Purposes therein mentioned." "29. An Act for enroling of certain Indentures of Lease and Release, executed by Sir William Dudley and Dame Elizabeth his Wife; and for making the Exemplification and attested Copies of such Indentures, and also of an Act of Parliament and certain Articles of Agreement therein referred to, Evidence in all Courts of Law and Equity in Ireland." "30. 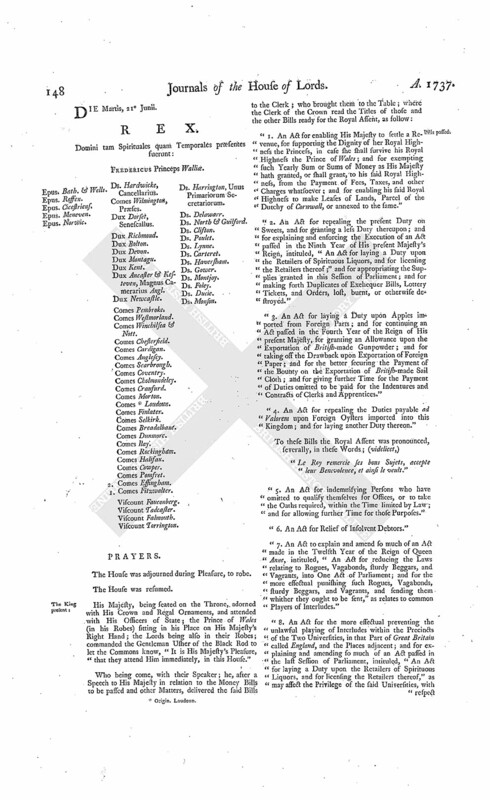 An Act for Sale of the Manor of Kippax, in the County of York, Part of the settled Estate of Sir Reginald Graham Baronet; and for settling his Estates at Norton and Nunwick, in the same County, being of greater Value, to the same Uses; and for making a Partition of the Manor of Whitwell, between him and his Brother Richard Graham Esquire." "31. An Act to establish an Agreement, made by the Devisees of Sir Samuel Ongley Knight, deceased, with Sir Roger Hudson Knight, for the Sale of Two Messuages, on the East Side of Bishopgate Street, in the City of London; and for the Purchase of Two Messuages on the North Side of Threadneedle Street, in the said City, with Part of the Money arising from the said Sale; and for other Purposes therein mentioned." "32. 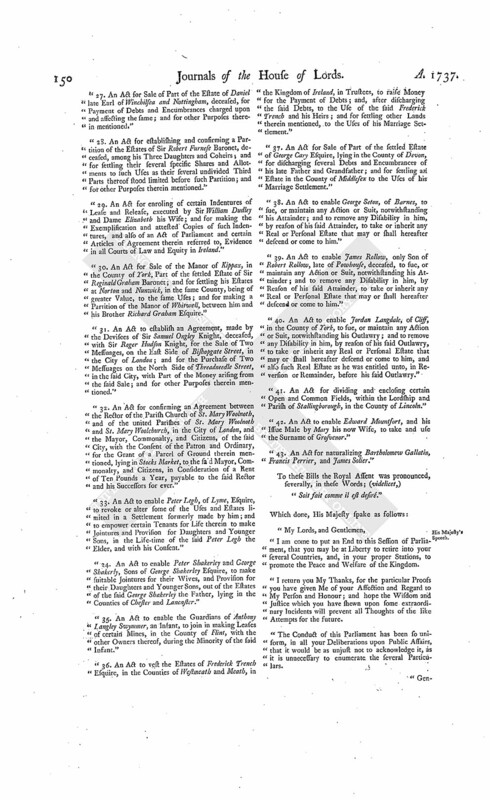 An Act for confirming an Agreement between the Rector of the Parish Church of St. Mary Woolnoth, and of the united Parishes of St. Mary Woolnoth and St. Mary Woolchurch, in the City of London, and the Mayor, Commonalty, and Citizens, of the said City, with the Consent of the Patron and Ordinary, for the Grant of a Parcel of Ground therein mentioned, lying in Stocks Market, to the said Mayor, Commonalty, and Citizens, in Consideration of a Rent of Ten Pounds a Year, payable to the said Rector and his Successors for ever." "33. An Act to enable Peter Legh, of Lyme, Esquire, to revoke or alter some of the Uses and Estates limited in a Settlement formerly made by him; and to empower certain Tenants for Life therein to make Jointures and Provision for Daughters and Younger Sons, in the Life-time of the said Peter Legh the Elder, and with his Consent." "34. An Act to enable Peter Shakerley and George Shakerly, Sons of George Shakerley Esquire, to make suitable Jointures for their Wives, and Provision for their Daughters and Younger Sons, out of the Estates of the said George Shakerley the Father, lying in the Counties of Chester and Lancaster." "35. An Act to enable the Guardians of Anthony Langley Swymmer, an Infant, to join in making Leases of certain Mines, in the County of Flint, with the other Owners thereof, during the Minority of the said Infant." "36. An Act to vest the Estates of Frederick Trench Esquire, in the Counties of Westmeath and Meath, in the Kingdom of Ireland, in Trustees, to raise Money for the Payment of Debts; and, after discharging the said Debts, to the Use of the said Frederick Trench and his Heirs; and for settling other Lands therein mentioned, to the Uses of his Marriage Settlement." "37. An Act for Sale of Part of the settled Estate of George Cary Esquire, lying in the County of Devon, for discharging several Debts and Encumbrances of his late Father and Grandfather; and for settling an Estate in the County of Middlesex to the Uses of his Marriage Settlement." "38. An Act to enable George Seton, of Barnes, to sue, or maintain any Action or Suit, notwithstanding his Attainder; and to remove any Disability in him, by reason of his said Attainder, to take or inherit any Real or Personal Estate that may or shall hereafter descend or come to him." "39. An Act to enable James Rollow, only Son of Robert Rollow, late of Powhouse, deceased, to sue, or maintain any Action or Suit, notwithstanding his Attainder; and to remove any Disability in him, by Reason of his said Attainder, to take or inherit any Real or Personal Estate that may or shall hereafter descend or come to him." "40. An Act to enable Jordan Langdale, of Cliff, in the County of York, to sue, or maintain any Action or Suit, notwithstanding his Outlawry; and to remove any Disability in him, by reason of his said Outlawry, to take or inherit any Real or Personal Estate that may or shall hereafter descend or come to him, and also such Real Estate as he was entitled unto, in Reversion or Remainder, before his said Outlawry." "41. An Act for dividing and enclosing certain Open and Common Fields, within the Lordship and Parish of Stallingborough, in the County of Lincoln." "42. An Act to enable Edward Mountfort, and his Issue Male by Mary his now Wife, to take and use the Surname of Grosvenor." "43. An Act for naturalizing Bartholomew Gallatin, Francis Perrier, and James Solier." "I am come to put an End to this Session of Parliament, that you may be at Liberty to retire into your several Countries, and, in your proper Stations, to promote the Peace and Welfare of the Kingdom. "I return you My Thanks, for the particular Proofs you have given Me of your Affection and Regard to My Person and Honour; and hope the Wisdom and Justice which you have shewn upon some extraordinary Incidents will prevent all Thoughts of the like Attempts for the future. "The Conduct of this Parliament has been so uniform, in all your Deliberations upon Public Affairs, that it would be as unjust not to acknowledge it, as it is unnecessary to enumerate the several Particulars. "Your Care, as well in raising the Supplies necessary for the Service of the current Year, as in doing it in the Manner the least grievous and burthensome to My People, is a fresh Instance of your equal Concern for the Support of My Government, and for the true Interest of your Country. "You cannot be insensible what just Scandal and Offence the Licentiousness of the present Times, under the Colour and Disguise of Liberty, gives to all honest and sober Men; and how absolutely necessary it is to restrain this excessive Abuse, by a due and vigorous Execution of the Laws. Defiance of all Authority, Contempt of Magistracy, and even Resistance of the Law, are become too general, although equally prejudicial to the Prerogative of the Crown, and the Liberties of the People; the Support of the one being inseparable from the Protection of the other. I have made the Laws of the Land the constant Rule of My Actions; and I do with Reason expect, in Return, all that Submission to My Authority and Government which the same Laws have made the Duty, and shall always be the Interest, of My Subjects." "It is His Majesty's Royal Will and Pleasure, that this Parliament be prorogued to Thursday the Fourth Day of August next, to be then here held: And this Parliament is accordingly prorogued to Thursday the Fourth Day of August next."